I was impressed with the honest feed back I got on the phone with Robbie. I could tell the difference this dealer ship had over others that lure you in with lies. 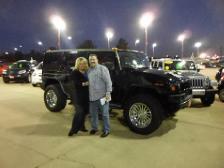 Upon our visit, my husband was hard to convince about the honesty of the dealer ship. I arrived with one car in mind to look at and found another I really liked!! I enjoyed the no pressure attitude from everyone that worked there and the honest prices on their vehicles. 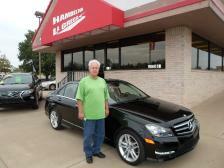 By the end I got my new car and my husband changed his mind about Hambelton La Greca. He was very impressed with everyone who work there and the friendly no hassle atmosphere. We will defiantly come back again no mater where we go. Everyone knows what a pain shopping for a car can be, but sometimes you find a dealership and a salesman that make it a lot more pleasant, that's what Hambelton LeGreca, and Robby did for us. Test drove car, made the decision, finished all the paperwork all in one day. Great job guys and thank you. I've had the best experience at Hambelton LaGreca! We have purchased our past 3 vehicals from Robby and each time we felt at home. He's always been honest and never gave us that "It'll run forever" shtick. Thank you Robby for all you've done for us! ­Love the Niblack/Igo family! I don't like car shopping so I did most of it online. I found a car I wanted to test drive so I took the leap to drive out to Hambelton LaGreca but with much resistance. I must say Robby Nunn was great to work with. From the moment he came out to the car he made me feel comfortable. Robby was easy to visit with and he answered my questions very confidently. He made me feel comfortable test driving the car. He trusted me to take the car out by myself. Upon my return he greeted me and continued to answer my questions again making me feel at ease. While inside the office they have very good music playing and no TV's! The atmosphere was pleasant as were the other employees. I know the negotiations could have been a little better but I still feel like it was fair and an easy process. I highly recommend Robby Nunn when you are ready to purchase your next car. My husband will be in the market for another truck soon and I will make sure he gives Robby the first opportunity! Thank you Robby! (Originally Posted on Google Reviews) A little over a week ago I went to Hambelton LaGrega solely to look around at pickups. I had no intentions of buying one in the immediate future. Met with their salesman Robby who was wonderful!! 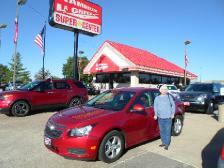 He is extremely knowledgeable on not only the vehicles on the lot but vehicles in general. Super nice guy!!! Was able to answer all of my questions or direct me to someone who could. Very honest and up front and not your typical car salesman that tries to hide things. Like I said, had no intentions of buying a vehicle soon but had such a positive experience with Robby, the rest of the staff, and their ability to make the price of the vehicle fit my budget that the next day I signed the paperwork and left with my newly purchased F-150 that I love!! 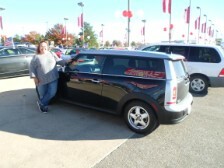 I wanted to thank you for the most wonderful experience in buying a car that I have experienced. In negotiating the deal and the items that were agreed upon for repair was Awesome. Robby whom was my sales person was very friendly and a lot of fun to work with. Meeting Fred, Kevin, Robby and Mark was a Blessing. From start to Finish with taking care of the repairs and follow up calls from Robby & Kevin was truly amazing. I have never had an experience like this in my life. I moved here 7 weeks ago and this was truly a Welcome to Kansas from your company. I will encourage anyone I know to visit your dealership first before considering anyone else. I will always buy my vehicles from you and have already encouraged friends I have met here to talk with your company when needed. You all are friendly, honest, and definitely stand behind the word “Integrity”. I’m sure your dealership will continue to grow and expand with service like this. I have posted on Google, and Facebook to all my friends about you and will continue to be your fan. Thank you for the Great service and Sales purchase I have ever made. Keep up the Great work! (Originally Posted on Google Reviews) Henry was GREAT!!! So nice and knowledgeable. 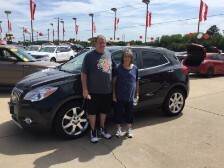 We were very impressed with everyone there and we love our "new to us" car! I would highly recommend giving them your consideration. 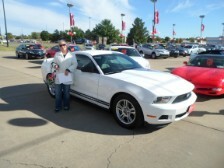 Their cars were all very clean and nice looking and we found just what we wanted. I was driving a car that had to many buttons that I had no idea went to what, The gas milage wasn’t what I expected and the Car didn’t do good in the snow when I bought it last year! I Came to Hambelton LaGreca in search of a car that got good gas mileage , did well in the winter times when I needed to get out and also something that was simple, that I didn’t feel overwhelmed by all the buttons. 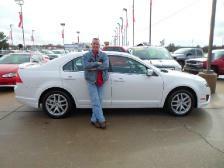 Robby had showed me a couple different vehicles like a Chevy Impala, a Chevy Malibu, and a Chevy Cruze! I Feel in love with the handling, the easy in town/ highway driving and the 36 MPG that these Chevy Cruze’s had to offer! I was not a big fan of the buying process but Hambelton LaGreca made it stress free and we were able to agree on trade and price in 5 minutes and I was driving my car Home in less then 45 Minutes! Thank you for making this the best car buying experience I have ever had! I have been looking for years for a 5 cylinder Colorado with the Options I want! My S10 was getting to old to be reliable anymore but I wanted to make sure I got what I wanted on my next Truck Purchase! 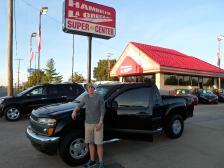 I saw the 2008 Chevrolet Colorado Z71 that had every option available PLUS some more! I Couldn’t believe this truck only had 64,000 Miles and was in my price range! My Salesman Robby made sure I got the Monthly Payment I was after and even gave me some Vendors to get a hold of for some extra goodies I want in the future! Thanks Hambelton LaGreca!!! Being Owners of a early 2000 Mercedes Benz Kompressor coupe- we showed interest in the 2013 Mercedes Benz C250! We love how comfortable and smooth the ride is in Mercedes Benz and needed another road trip car! We wanted to take the Mercedes Benz C250 to get a Full Inspection from Mercedes Benz , which was no problem with the friendly Sales team at Hambelton LaGreca . The Mercedes Benz passed with flying colors and the only thing left was to come to an agreement on Price! Buying Process was painless and took no time at all! Never been to a Dealership and had this great of an experience!! Needed a Vehicle that Held 6 Passengers but didn’t quite want to go with a van or an SUV. The Mazda 5 that Hambelton LaGreca had was perfect! Gas mileage and handling of a car with the capacity for seating like a van! After we decided the Mazda 5 would be the vehicle for us, the purchasing process was very Easy and Simple! We were able to secure a final price very fast and we were done and driving out of the dealership in a very short amount of time! 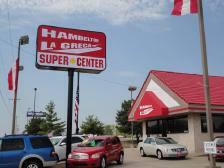 will do more business with Hambelton LaGreca in the Future! Thanks for the no hassle, no pressure experience we had ! Will send Friends and Family! We have been looking at the Chevrolet Traverse & GMC Acadia for quite some time, we wanted to find the best price for the best quality and also fit our allowed monthly budget for a car payment . 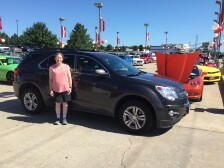 We were initially interested in a 2011 GMC Acadia SLE because it was in our price range and fit well with our predicted monthly payment, We came to Hambelton LaGreca to see the Vehicle and Found a 2011 Chevrolet Traverse 2 LT that had more Luxury options then the GMC Acadia and was Priced just a little above the GMC Acadia. With the Help from our salesman Robby and the Management Team at Hambelton LaGreca, we were able to get more luxury options that we thought we couldn’t get, with an excellent interest rate AND Stay within our Monthly Payment Range! Great Experience will come back to look at Trucks Next Year!!! We will never buy a car anywhere else. It so easy to buy here, never any pressure and always a great deal. We ask them that if they ever close to call us so we can stock up the whole family with cars.